Showing results for tags 'cinzia milani'. Brilliant Classics pubblica il nuovo CD della chitarrista italiana Cinzia Milani dedicato a Ida Presti e alla sua musica. Interpreti: Cinzia Milani Supporto: CD Audio Numero dischi: 1 Etichetta: Brilliant Classics Data di pubblicazione: 1 settembre 2017 Tracklist Dal sito dell'editore: ‘One of the greatest guitarists of all time,’ remarked John Duarte in his entry on Ida Presti for Grove’s Dictionary of Music and Musicians. Best-known in posterity as one half of the celebrated Presti-Lagoya duo, she is celebrated on this album as a composer and virtuoso in her own right, half a century after her unexpected death in the middle of a US concert tour, at just 43 years of age. In her booklet-note, Cinzia Milani remarks that she has always considered Presti a role-model, not only for her prodigious talent as a guitarist, but as a female musician in a culture and industry still often dominated by male authority. She presents here six studies by Presti herself, a Danse rhythmique and an Etude du matin, and Presti’s tribute to her own hero, Segovia. Just as Presti dedicated the dance to her husband Lagoya, so Milani follows it with two works which he in turn dedicated to her. Then there are various works by composers little known outside guitar circles such as Miguel Ablóniz and indeed Duarte. Through all these works may be traced the joyous personality of Presti herself, summed up by her granddaughter Isabelle in the booklet as ‘elegant nimbleness, luminous musicality and wonderful self-confidence’. She was friends with many of the composers such as Gontran Dessagnes, who wrote his Tendesse for her in 1954. The work by Guy Morançon is a tribute to her memory, composed in the wake of her death. Finally, Milani has written her own tribute, Quattro Mi, in admiration for the extraordinary facility of Presti in holding down the note E (Mi in solfege) on four different strings simultaneously. By its nature, the album is unique in the catalogue, of immediate interest to guitarists and anyone curious about a great artist of the last century. 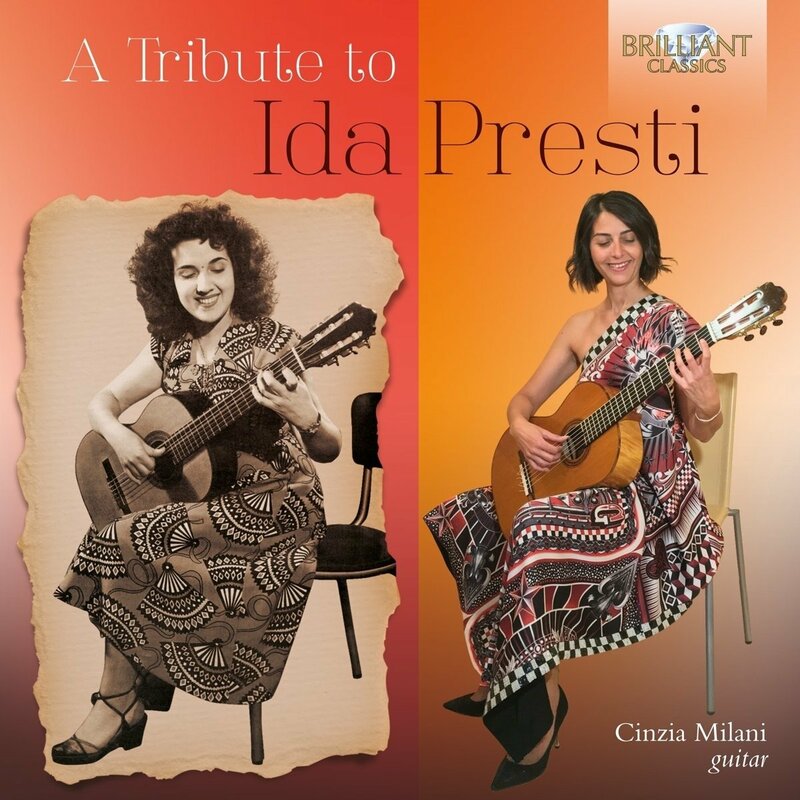 This recording was made on the occasion of the 50th anniversary of the death of Ida Presti, one of the greatest guitarists of the 20th century, a pioneering woman who used her extraordinary talents for the popularization of her instrument and the music written for it. Italian guitarist Cinzia Milano compiled the program for this new recording, consisting of original works by Ida Presti as well as works by other composers which are dedicated to her: Alexandre Lagoya, Miguel Ablóniz, John Duarte, Dimitri Fampas, Gontran Dessagnes and Francis Poulenc. The booklet contains contributions by the artist as well as by Isabelle Presti, the granddaughter of Ida Presti.